In practice it is observed that the power lines and the communication lines run along the same path. Sometimes it can also be seen that both these lines run on same supports along the same route. The transmission lines transmit bulk power with relatively high voltage. 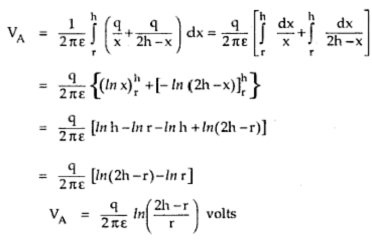 Electromagnetic and electrostatic fields are produced by these lines having sufficient magnitude. Because of these fields, voltages and currents are induced in the neighbouring communication lines. Thus it gives rise to interference of power line with communication circuit. Due to electromagnetic effect, currents are induced which is superimposed on speech current of the neighbouring communication line which results into distortion. The potential of the communication circuit as a whole is raised because of electrostatic effect and the communication apparatus and the equipments may get damaged due to extraneous voltages. In the worst situation, the faithful transmission of message becomes impossible due to effect of these fields. Also the potential of the apparatus is raised above the ground to such an extent that the handling of telephone receiver becomes extremely dangerous. The electromagnetic and the electrostatic effects mainly depend on what is the distance between power and communication circuits and the length of the route over which they are parallel. Thus it can be noted that if the distortion effect and potential rise effect are within permissible limits then the communication will be proper. The unacceptable disturbance which is produced in the telephone communication because of power lines is called Telephone Interference. 1) Because of harmonics in power circuit, their frequency range and magnitudes. 2) Electromagnetic coupling between power and telephone conductor. The electric coupling is in the form of capacitive coupling between power and telephone conductor whereas the magnetic coupling is through space and is generally expressed in terms of mutual inductance at harmonic frequencies. 3) Due to unbalance in power circuits and in telephone circuits. 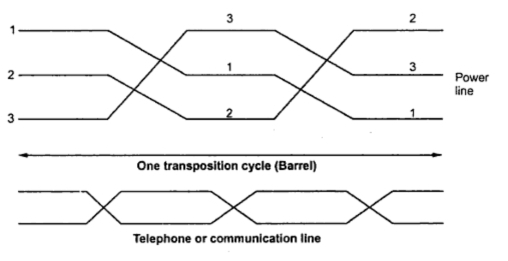 4) Type of return telephone circuit i.e. either metallic or ground return. 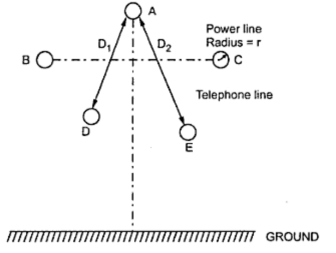 Consider a line transmitting power with 3 conductors A, B and C. Consider a telephone line with two conductors D and E below the power line conductors. The two lines are running on the same supports. This is shown in the Fig. 1. Here M is the net mutual inductance which is the phasor sum of the three inductances. From the above expression, it can be seen that with increase in distance between power and communication line, the values of MA, MB and MC nearly becomes equal in magnitude and with the result that the net inductance M becomes very very small. 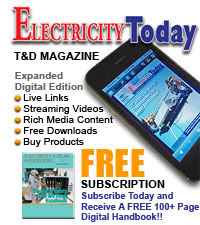 As a consequence the voltage induced in telephone lines also diminshes. The voltage induced in the neighbouring telephone line is directly proportional to frequency. If third harmonic is present then voltage equal to 3 times the voltage due to harmonic currents in power line is additive. In unbalanced condition i.e. during fault the flux linkage and corresponding voltage induced is very high which may prove to be dangerous for telephone circuits. The presence of harmonics and multiples of third harmonics will not cancel as they are in phase in all power line conductors. In balanced condition the total induced voltage due to harmonic currents in power line is additive. In unbalanced condition i.e. during fault the flux linkage and corresponding voltage induced is very high which may prove to be dangerous for telephone circuits. If the distance between power line and the telephone line is increased then the induced voltage in telephone line van be reduced. It can also be reduced by transposing the line. 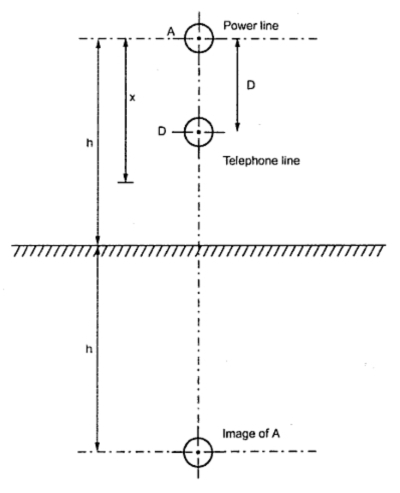 Consider the line conductor A running parallel to infinite plane (i.e. earth). Let D be the conductor from neighbouring telephone line. Conductor A' is the image of conductor A below ground as shown in the Fig. 2. The potential distribution between the conductor and earth is exactly same as that of its image and the plane. The above addition is the phasor addition. 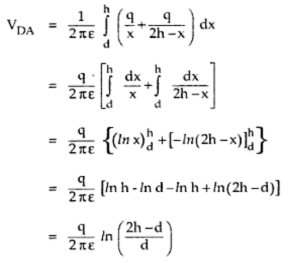 Similarly the resultant potential of point E, VE can be calculated using the same procedure. i) The harmonics at the source can be reduced with the use of A.C. harmonic filters, D.C. harmonic filters and smoothing rectors. ii) Use greater spacing between power and telephone lines. iii) The parallel run between telephone line and power line is avoided. iv) Instead of using overhead telephone wires, underground telephone cables may be used. v) If the telephone circuit is ground return then replace it with metallic return. vi) Use microwave or carrier communication instead of telephone communication. vii) The balance of AC power line is improved by using transposition. 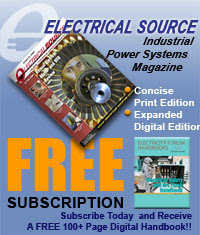 Transposition of lines reduces the induced voltages to a considerable extent. The capacitance of the lines is balanced by transposition leading to balance in electrostatically induced voltages. Using transposition the fluxes due to positive and negative phase sequence currents cancel out so the electromagnetically induced e.m.f.s are diminished. For zero sequence currents the telephone lines are also transposed which is shown in the Fig. 3. Transposition of conductors proves to be effective under normal working conditions which may be inadequate under faulty conditions.